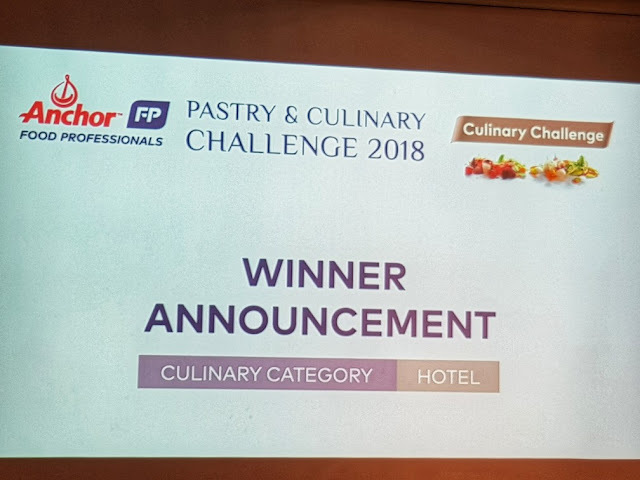 Anchor Food Professionals as the unrivalled leader in the dairy foodservice industry once again did their part in raising the benchmark in the industry by hosting the highly anticipated Anchor Food Professionals Pastry & Culinary Challenge 2018. The four-day competition which was held recently was based on three categories namely Pastries, Cake and Culinary. The luminary panel of judges consisted of Top Pastry and Culinary maestros such as Chef Jean Francois Arnaud MOF serving as the Head Judge in Pastry Category, along with Chef Nazeri Ismail, and Chef Arthur Heng. In the Culinary Category, Chef Gerhard Albrecht served as the Head Judge, along with Chef Fami Taufeq and Chef Sabri Hassan. Linda Tan, Director of Anchor Food Professionals said that competitions like this were vital for the industry as it is a platform for the sharing of experience and knowledge, as well as to nurture the potential of Malaysia’s future culinary and pastry artisans and elevating the standards of the food & beverage industry. Each day of the challenge saw different contestants from different industries competing in Pastry (13 March; Bakery channel), Cake (14 March for Bakery Channel and 15 March for Hotel Channel) and the newly added Culinary Category (16 March for Hotel Channel). In the Pastry Category the contestants are required to create a simple croissant and a Danish whereas under the Cake Category each contestant is required to create two types of cakes with Mango and Strawberry themes respectively. In the Culinary Category, which I was fortunate enough to attend, contestants were given the theme 'Land and Sea of Malaysia' with an inculcated twist of Modern French Cuisine. Contestants were required to prepare a 3-course meal based on the theme and criteria given. The chefs had to prepare a harmonised 3 COURSE MENU that was inspired by the theme with a twist of Modern French Cuisine. There was also a “MYSTERY” ingredient which was revealed to all participants during the competition; it was then used in both Hot / Cold Starter and also the Main Course. There were a total of 25 finalists competing in this Challenge in all three categories separately. The first prize for each category includes prizes worth RM5,000, a medal and certificate, second prize includes prizes worth RM3,000, a medal and certificate and finally, third place includes prizes worth RM2,000, a medal and certificate. The participants of the competition naturally scored more points with the use of Anchor’s leading products in the diary segment namely Anchor Cream Cheese, Anchor Butter Sheet, Anchor Butter, Anchor UHT Milk, Anchor Whipping Cream, and Anchor Extra Yield Cooking Cream.